Reliable hardware quality is the key to long-term successful POS projects in retail and hospitality. However, the cash register’s appearance plays just as an important role. Anyone who wants to not just convince their customers but also entice them has to likewise fulfil the demands for long-term performance and exceptional optics. The POS system from the premium manufacturer Colormetrics merges perfect engineering with exceptional design, ensuring the enthusiasm of both retailers and customers alike. Designing a POS system was until now considered to be a chore rather than a pleasure, even for brand name manufactures. No wonder that the optics of many touch screen POS systems were often seen as dull or old-fashioned in the age of stylish vacuum cleaners and designer mobile phones. For many customers, a cash desk is a significant feature in their own boutique, bar or restaurant, and is often the first thing that catches the eyes of customers and guests. If grey PC monotony and plastic are dominant, or if modifications have to be first made to the system, then there is no fun in choosing a suitable cashier. With the POS system, you finally offer your customers a system that is really something extraordinary! A slim design – wall-mounted as panel or with stand as desktop version – and durable materials with a high-value feel make the system a real bestseller. Very important: everything promised by the optics is also ensured by the engineering. The systems are stable and the housing is made of a robust aluminium. The internal workings of the high-value, industry-tested components perform faultlessly, even after continuous operation over many years. In the case of a failure, critical components such as the hard drive are accessible for maintenance or replacement within seconds. 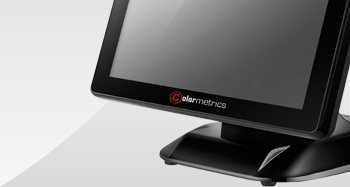 As development partner of the innovative manufacturer from Taiwan, Jarltech sells the POS system from Colormetrics worldwide.